Takeaway: As high-density vertical farming and hydroponics evolve, so does LED lighting. New photonic films are making the manufacturing of LEDs easier, while providing better, more efficient lighting for growers. Light-emitting diode (LED) lighting is one of the top energy-efficient solutions for grow lighting in any indoor farming environment, lowering both the operation's direct power and climate control costs. However, higher installation costs and lighting spectra that have often proven too narrow for healthy plant growth have been serious issues with LED lighting that growers must consider when deciding on what lighting to install. With the efficiency of the actual LEDs themselves plateauing, the opportunity to make substantial improvements in LED lighting comes from enhancing the efficiency of the light-conversion optics. Light “down-conversion” is a key phenomenon used in today’s LED lighting technology whereby high-energy (shorter wavelength) blue photons from a diode are absorbed by a phosphorescent material and then re-emitted at a lower energy (longer wavelength) in the green to red color spectrum. Since blue LEDs are the most efficient source of light, down-conversion is key to creating different colors by converting the blue light into other useful wavelengths, such as green and red, or even combining all colors to produce white light. Traditional LEDs have a phosphor-based down-conversion coating applied directly on the LED. Instead of a direct coating on each, blue light from multiple uncoated LEDs can be down-converted by a remote photonic film. Current down-conversion film technology employs silicon resin, using two chemical components combined with phosphor admixtures. These films are not very efficient at emitting the desired spectra (light wavelengths) and emit heat due to index-matching losses. The creation of these films is a time-consuming process, lowering manufacturing yields and increasing cost for lighting fixtures. They also require toxic chemicals and special tools to create. A new generation of photonic films addresses these problems. Using lyotropic materials, these films are very dense, providing better down-conversion efficiency, and are much more stable, meaning the spectra emitted will not degrade over time. Improved chemistry also lowers manufacturing costs by speeding up the manufacturing process and eliminating the use of surfactants and toxic chemicals. Unique formulations of the lyotropic chemistry provide control of the refractive index of the film to create less waste heat. The manufacturing process is easy to scale, leading to substantial economic efficiencies in manufacturing LED lighting compared to traditional LED fixtures. Light-emitting diode lighting fixtures created with these films are not just simpler to manufacture, leading to lower installation costs, they are more efficient to operate and emit less heat than regular lights. This can lower both the ongoing power and climate control costs of a facility when compared to traditional LED fixtures. For vertical farming applications, plants can be placed closer to the lights, increasing space-efficiency and productivity within a footprint. In addition, custom films can be created with any desired growth spectra, meaning discerning growers can ensure that plants receive the exact type of light they need. For high-density vertical farming and hydroponics to become more efficient, LED lighting must become an economic choice to install and operate. In addition, LED lighting must become an effective choice to deliver the results growers need. 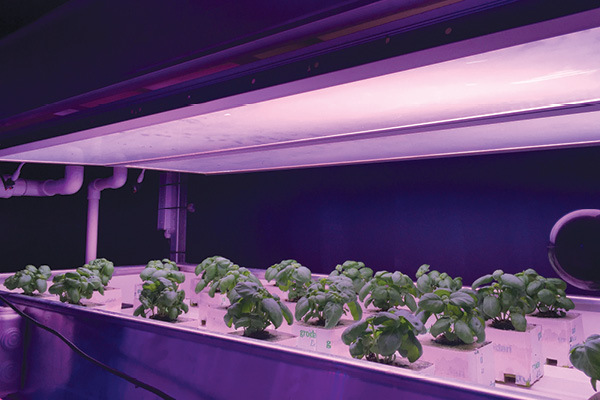 Photonic light-conversion films help LED fixtures take the next step in efficiency by lowering costs and delivering the highest quality grow spectra available. The new technology delivers high-efficiency lighting, meaning the same amount of light is delivered using up to 25 per cent less power than current LEDs. The conversion efficiency of the film also means less waste heat is created, lowering costs for climate control and allowing the placement of lights much closer to plants. Closer positioning increases light penetration into the canopy while allowing an increased density of plants (plants per cubic foot) in vertical farms. Lyotropic materials are common in nature, and make up our muscles and many other biological systems. They have self-aligning properties, using only water as the key medium, and can help lower production costs by simplifying the coating and manufacturing processes. By using only water in manufacturing process, these lyotropic materials eliminate the use of toxic chemicals that can damage the environment. Another unique property of lyotropic material is the tunable refractive index, which is an essential attribute for index-matching in optical applications. With precise control over the refractive index, films created with lyotropic materials allow higher down-conversion efficiency, meaning LED fixtures with lower power usage and less waste heat. View Maximum Yield's complete list of LED articles for more information on LED grow lights.